Though the software powering the experience does come with a few freckles, the My Cloud Home still mostly manages to offer a degree of ownership, control and consolidation over your digital footprint that sells itself. For a while there, things weren’t looking so rosy for the now-ubiquitous cloud. It made the journey from emergent technology to buzzword to the tabloids in record time. Still, we’ve reached a point now where consumers are (mostly) pretty comfortable with allowing their data to live on the cloud. Of course, that's the only problem. It's not “your” cloud. Relying on the cloud fundamentally means you need to rely on (and trusting in the security of) someone else’s servers. Sure, you might have backed up all your bank statements on a service like Dropbox - but you don’t actually know where in the world that data is being held. This means that if something goes wrong, it’s out of your hands. These big cloud services can make for juicy targets and if one ever suffers a major outage, hack or other form of security breach - your slice of the cloud could easily end up collateral damage. It’s time to take back the Cloud. Or at least, your Cloud. 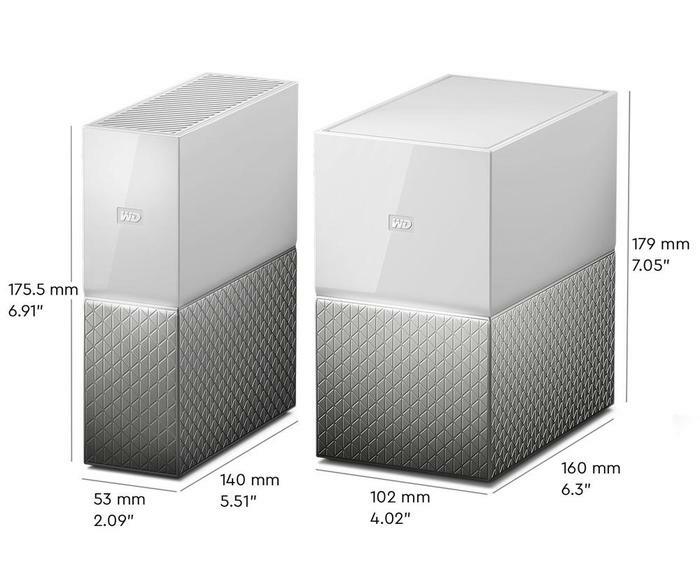 That’s the pitch behind Western Digital’s new My Cloud Home. The successor to the company’s original My Cloud and My Cloud Mirror products, the My Cloud Home and My Cloud Home Duo offer up more on-board RAM, faster processor speeds, automated firmware updates and a streamlined setup experience regardless of whether you set the unit up using the desktop or mobile apps. The WD My Cloud Home is a network-integrated portable hard drive that allows you to operate your own personal cloud. It’s got a 1.4 GHz quad-core RealTek processor, 1GB of RAM and comes with a two year warranty. The My Cloud Home is available in 2TB, 3TB, 4TB, 6TB and 8TB sizes. There’s also a larger My Cloud Home Duo on offer, which is available in 4TB, 6TB, 8TB, 12TB and 16TB variants. 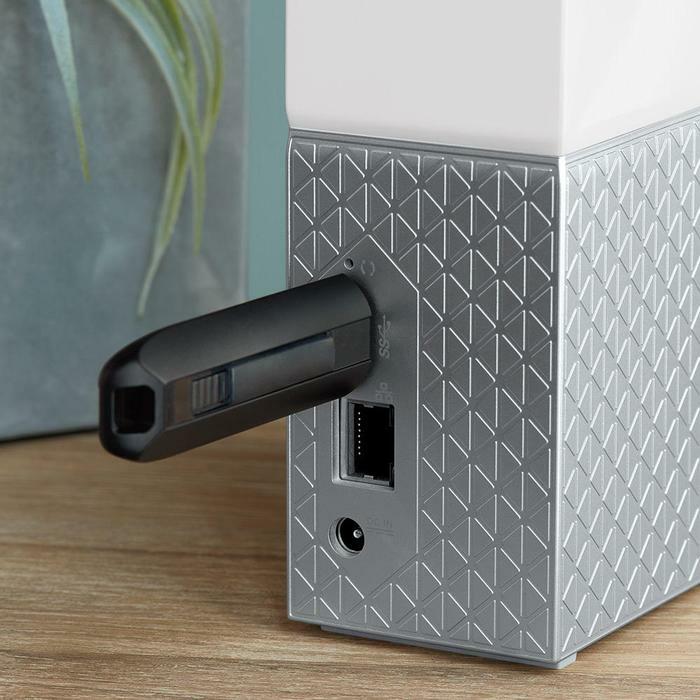 If there was ever a product that makes the phrase “network-attached cloud storage solution” look stylish, it’s the WD My Cloud Home. It’s fairly minimalist, borrowing the same solid-but-striking white and textured silver design seen in WD’s latest My Passport range portable hard drives. It worked well enough there, and it does so again here - though the absence of a physical on/off button from the basic My Cloud Home does seem like an odd omission (given that the plus-sized Duo does have such a button). Regardless, the My Cloud Home shakes out as a noticeably bulkier take on the formula. Boasting the rough form-factor of a thick book, and bearing a cover that thrives on contrast, it’s about the size of a vertical or tower modem. Still, it keeps things relatively simple, clean and as inconspicuous as you’d probably want something like this to look. Frontwise, there’s a single LED light built into the front of the unit which indicates whether or not it's connected the internet. Meanwhile, on the back there’s a power input, ethernet output and a single USB 3.0 port. Unfortunately, these ended up feeling a little limiting and probably one of the larger weak points on the device. There’s something to be said for minimalism. However, given that the comparisons between what WD are offering here and a NAS basically write themselves, the single USB 3.0 port feels like it doesn’t offer a particularly competitive level of utility. That said, if you opt for the My Cloud Home Duo, it does configure itself to RAID1 from the outset letting the second drive act as a backup for the first.